You’ve read the books, you’ve gathered the advice, and potty training has officially begun! Whether you chose the boot camp method or the wait-and-see method, there comes a time when you have to leave the house with a newly trained or still-training child. Don’t fret, it happens to all of us, and you (both) can do it. Although I don’t recommend that you start potty training right before a trip or any other big event, at some point, you’ll have to drive farther than 30 minutes away from home, get on an airplane, or stay in a hotel. When life happens, don’t throw all your hard work out the window. Keep potty training, with slightly adjusted expectations, and consider some of these tips. Bring a potty in the car. When I was potty training my two oldest children, I had Ikea potties everywhere—everywhere—in the bathroom, in their bedrooms, in the car. An Ikea potty went with us everywhere, for several reasons. First of all, the kids were comfortable with it, they knew what to do with it, and, unlike foldable potty seats, there was no chance of getting pinched. We could have a potty at the park, on a road trip, in the middle of nowhere. It was wonderful. Plus, they are supereasy to clean out, with no inserts, moving parts, or crevices. A quick emptying out and a few wipes with a cleaning spray (or baby wipes), and we were on our way. Help them face their fears. Public restrooms are intimidating for adults. It would be so much easier if kids weren’t fearful of anything in a public restroom, but they pick up on our fears quickly. From an early age, I taught my kids to use public restrooms without a fuss. We traveled quite a bit, and they just had to get used to it. Even now, they have to try to go each time we stop, and there is little fuss. The scariest thing for toddlers in a public restroom? The automatic flusher. One way to prevent the flusher from scaring them—which I did when they were little, gradually easing them into it—is to put a sticky note over the sensor. That way, you can still teach them to flush without it startling them. Skip the potty seat for on the go. I hated using potty seats. They were a bear to keep clean, they were just one more thing to carry, and they never seemed safe to me. At home, we used a semipermanent insert that just made the big toilet seat their size. Out in public, I would either use our Ikea potty or help them on the regular-sized toilet. I’m not against those portable seats, I’m just a bit of a minimalist. I was frequently helping one kid on the toilet while keeping a close eye on the second one. As a military Solo Mom, I made those bathroom trips on my own the majority of the time, and there were no spare hands for potty seats. Up your rewards. On a recent road trip, my mom told the kids that after 100 miles they’d get a treat. I had never thought about this technique with older kids who plainly knew how to behave in the car. But it made me think about potty training on the go and how you could up the ante when it comes to rewards. If you do a sticker chart at home, bring the chart with you, and add some extra prizes or more frequent rewards. A little bribe never derailed the whole parenting operation, right? Forgive accidents. This is important with potty training no matter where you are. 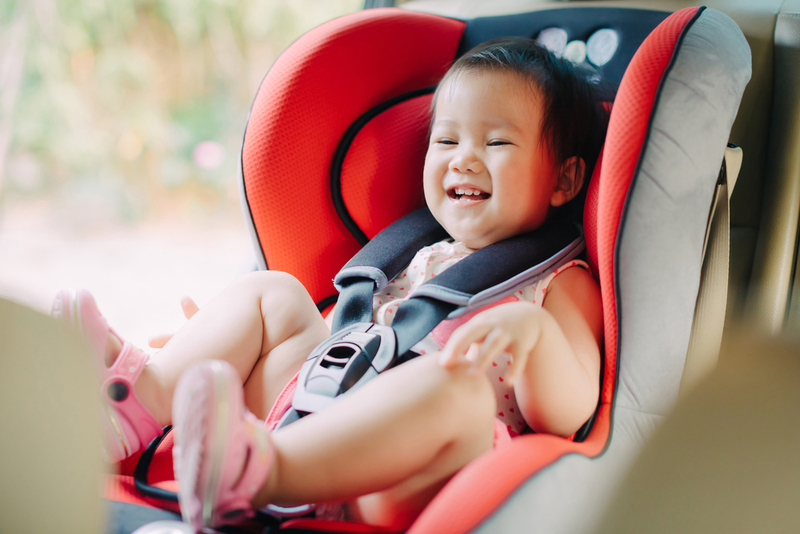 Don’t freak out over accidents because you don’t want to put too much pressure on a toddler. But, especially, don’t worry too much about them when you’re on the go. If you’ve tried everything to help your child, and he has made an effort, then let it go. Clean up the mess, change your child’s clothes, give him a hug, and say, “Let’s try again next time!” One thing I love to keep in the car are wet bags (the ones people use for cloth diapers), as they can contain all the mess kids can make, and baby wipes. No matter how old your kids get, they never outgrow baby wipes. They are a staple in every suitcase and for every road trip. Try everything. No one approach works with every child, and you’ll need several methods for each individual child. When you work as a team with your child and others involved in their life, you will have the best success rate. After my oldest was potty trained, he took an active role in helping with the second child. I can only imagine my baby when he gets to that stage with two big siblings eager to help out. Don’t let others stand in your way, either. I remember brazenly defying a flight attendant when she told me it was “too risky” to go to the bathroom with my three-year-old. My child said she had to go, and I was her advocate. Remember, it takes a village to raise a child, and for Solo Moms with children in child care, it takes a village to potty train, too. Just as you share the dirty work with your child’s care provider, there are others who are willing to help out on this journey. When traveling, you’ll often find people who are willing to let you cut in line or borrow child-sized potties. In fact, when we went to Legoland, I was amazed at all the child-sized toilets and the extra insert for little bottoms in the hotel rooms. Potty training will change your life (yay, no more diapers! ), but it doesn’t have to change your lifestyle while you’re doing it. Keep traveling, Solo Mom. Keep living. Have any great toddler travel tips to share? We’d love to hear them!